Sport has become an important avenue in how we interpret, remember, and maintain our heritage. Whether it is being applied in tourism marketing and development, employed as a vehicle for social cohesion, or utilized as a way of articulating personal and collective identities, sport heritage is a vital topic in understanding what we value about the sporting past now, and what we wish to pass on to future generations. This edited collection brings together many new and exciting international approaches to sport heritage. 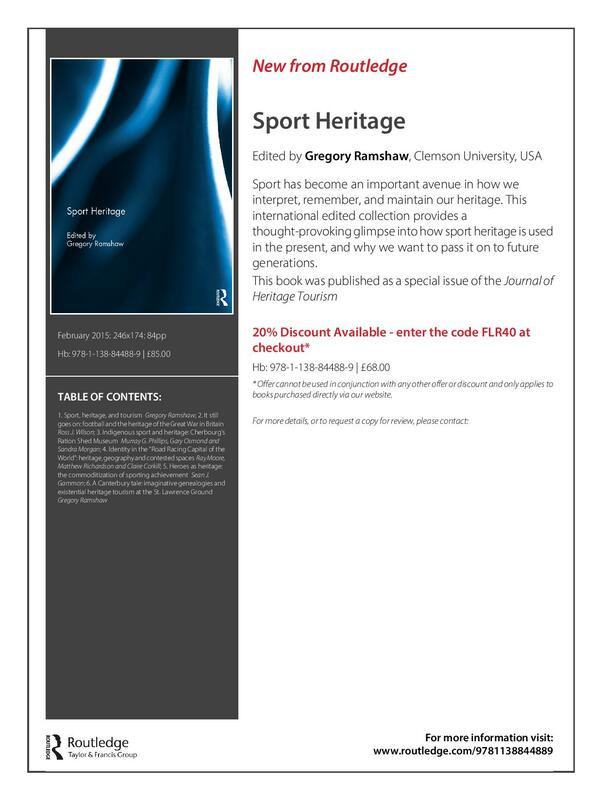 Each of the chapters in this collection provides a thought-provoking sport heritage case study that would be of interest to students and researchers in history, geography, anthropology, and marketing, as well as industry practitioners working at sporting events, at sports-based heritage attractions such as museums and halls of fame, and at sports stadia and facilities. In addition, this collection would be of interest to those readers with a more general interest in sport heritage and the sporting past. My strong recommendation, given the cost of the book, is to recommend that your university library purchase it. There is a “recommend to the librarian” link on the Routledge webpage. Please also spread the word to anyone who may be interested in this collection. Sport heritage research has come a long way in the past decade or so, and I strongly believe the work of the researchers in this book helps to take our understanding of this topic in new and fascinating directions. By Gregory Ramshaw in Uncategorized on February 2, 2015 .